Southern Cross is one of the biggest hits of the Crosby, Stills & Nash trio. The song is great for learning strumming and syncopation (which is when you accent beats that would normally not be accented). Our guitar lesson on Souther Cross is great for beginners, since we’ll be using just 3 chords, D, G, and A. This is actually another I-IV-V song in the key of D.
We’ll start the tutorial by reviewing the chords we’ll use during the song. Needless to say this section of the lesson is pretty short J The D, G, and A are basic chords you should be familiar with already, but if you’re not, check out this basic lesson on chords. Next, we’ll learn 2 versions of the intro. This section of the song returns several times during the piece, and is actually the staple of the song. With the first version, we’ll keep things nice and simple. Just a few strums and 2 added notes. 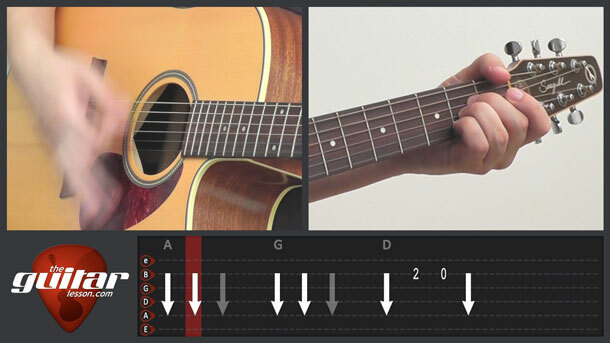 In the 2nd version, we’ll take things a bit further, and introduce a lot of muted strumming. Since we’re using open chords, muting them will be a bit tricky at first, so you’ll probably need to practice it for a few days, before you get it down. In the second version of the intro, we’ll also add a little embellishment to the D chord, using the Dsus4 and the Dsus2. Next up, we’ll learn to play the verse to Southern Cross. We’ll strum to the same chord progression as in the intro, while keeping a general 8th note feel. I’ll show you a strumming pattern that sounds nice, but feel free to make up your own strumming pattern. If it’s in line with the rhythm of the songs, and it sounds good, it is good. They vary things up a little where they sing "We go eigthy feet of waterline, nicely making way", by adding the only barre chord of the song, a Bm. Next we’ll learn the prechorus, which is just quarter note strums on the A major. And what comes after the prechorus? The chorus of course 🙂 We’ll use strumming and syncopation to play the chorus, I’ll explain the details in the video. The ending of the song is really interesting as well, it ends on a D, not A as you would expect. The song is about failed love, so you can only guess why it would end in a way, which leaves you wanting more. Nice! Southern Cross was released by Crosby, Stills and Nash in 1982, but actually, the song wasn’t originally written by the trio. It was written by Rick Curtis and Michael Curtis, and was called Seven League Boots. Stephen Stills rewrote the words and music of the song. Southern Cross is about a man who sails the world following a failed love affair. During the voyage, the singer takes comfort in sailing in the beauty of the sea, and particularly in the Southern Cross, which is a constellation by which sailors in the Southern Hemisphere navigate. But the sailor’s final consolation is music. The music video for the song featured a sailing ship, and saw heavy rotation in the early MTV years. Sorry, but you've reached a premium content area. The download of the Southern Cross tablature file is only available to premium members. Sorry, the same goes for the backing track. To download the backing track to Southern Cross, please log in and revisit this page.